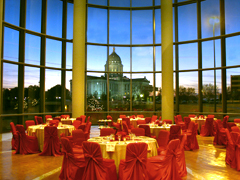 The Oklahoma History Center offers a unique setting for your special events, from the most elegant celebration to informal gatherings. The Devon Great Hall is a striking setting for evening events. Hardwood floors with polished granite accents create an atmosphere of sophistication. A soaring eighty-foot floor-to-ceiling glass atrium offers a dramatic view of the Oklahoma State Capitol. 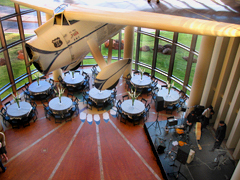 Guests will marvel at the replica of Wiley Post’s famous Winnie Mae airplane suspended overhead. 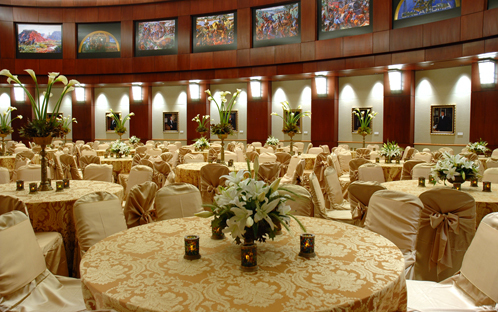 The Chesapeake Event Center and Gallery is an extraordinary meeting space for distinctive occasions. Rich wood walls and granite highlights are accented by elements of artwork from the State Capitol. Complete with a built-in stage, rear-projection screen, wireless audio, remote-controlled video, and variable lighting, this venue is fully equipped for gatherings. Groups can be comfortably seated in banquet, theater or lecture-style seating in this beautiful meeting room. Additional evening event settings include the Cooper and Gladys West Atrium Wing and Gallery, the Atrium Bridge, the picturesque Rhonda and David Walters Plaza featuring the Colonial Dames Fountain, and the East Terrace featuring Harold T. Holden’s majestic sculpture Monarch at Rest. The facility fee is very reasonable and includes setup, staffing, security, maintenance, and audio/visual equipment use. Preferred catering is available on-site, while outside catering is allowed with prior approval and additional fee. Special discounts are available for government and non-profit organizations. Let the Oklahoma History Center’s knowledgeable and capable staff help make your event a success.